On my recent trip to London I knew that there was one place I definitely had to go: Leighton House. I have blogged about the first time I ever went there, but they have since lifted their No Photography policy so I was very excited to see it again. Unfortunately I was using my favourite lens, which wasn't the right lens for taking pictures of the house, so I only have a few, but at least I have those. I'll be better prepared next time. This is the ceiling of the dome in the Arab Hall which was all meticulously repainted by hand in the House's restoration works in 2011. I love the way the gold paint reflects the light from the lamp within the dome. You can't get more cosmic than domes + light. A small selection of some of Leighton's amazing Iznik tiles that he collected on his travels. What a guy. Just look at all that detail. Not a space left untouched. Narcissus in front of the Arab Hall. There is a small pool in the centre of the Arab Hall; I like to think that this statue serves as a warning. 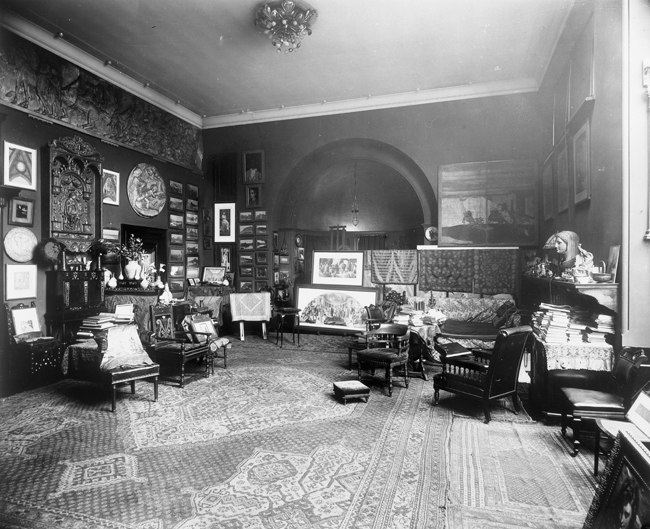 One of my favourite things about Leighton House (which I wrote about far more eloquently in my dissertation) is the way the whole building is a total artwork because it is composed of smaller ones. Yes, the paintings and the tiles, but also the rooms themselves are framed as pictures. Even the floors are framed in mosaics or rugs on hard wood. All of the door frames are painted dark like these above, highlighted by the sunflowers. Viewing a room through a doorframe makes it a work of art. Unfortunately this picture is blurry, but it's a view across the landing from standing outside Leighton's bedroom to his studio. The studio is not quite as decadent and Victorian as it was, but the Museum have put a lot of effort into including the types of things that would have been visible when Leighton was using the room. This is what the studio looks like now. It's rather empty, really, but it's great for understanding the types of things Leighton would have surrounded himself with. My favourite features of this room include: the massive window to let light in for painting & models would pose underneath; the alcove at the end of this picture, echoing the dome downstairs; and, unseen in this picture, a large wooden screen with a stair access behind it. I can't remember now why the screen was built, but I do remember that famous musicians used to stand up there & play. 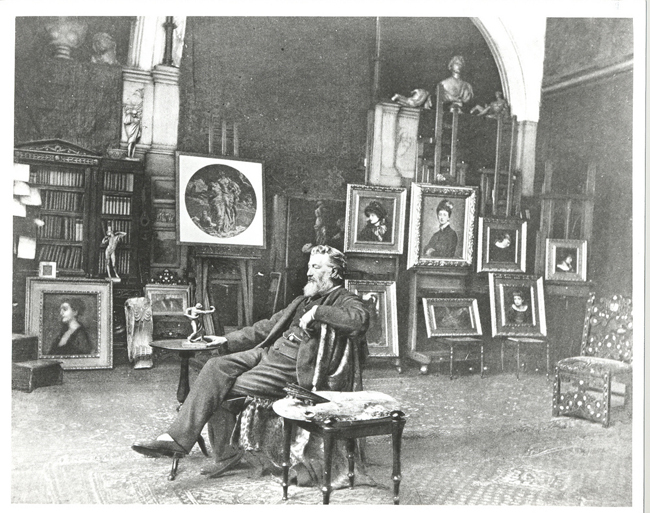 This is the studio in around 1890. As you can see, it's a little busier. 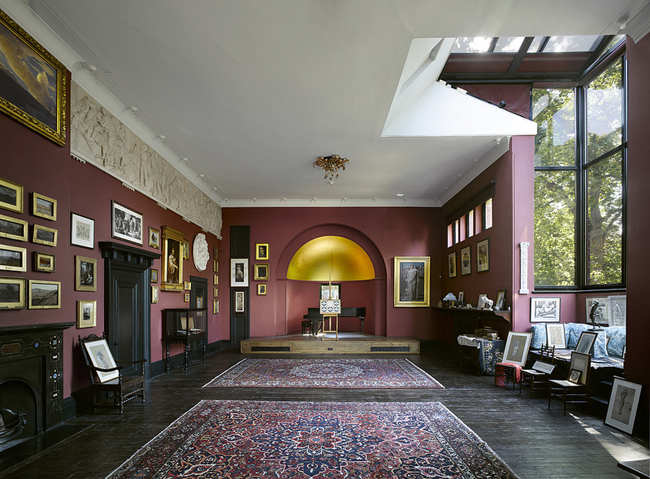 Many of Leighton's effects were auctioned off after his death which is why the House doesn't appear exactly as it did. I love this picture though, and the first time I saw it I was overcome with joy. And here's the man himself, being awesome.